My Typo Humour: Witch filling? Here's a very welcome contribution from Chris M who spotted this in Burnley. Now I'd like to think that, due to Burnley's proximity to Pendle Hill, some plucky entrepreneur has seized a great marketing opportunity. 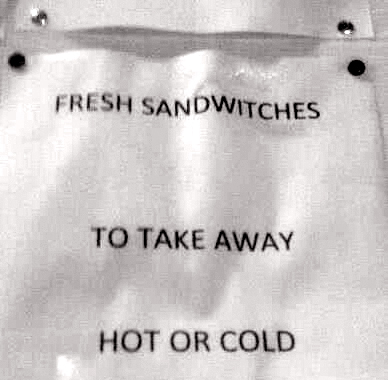 But no, a quick Google search for 'sandwitch shop' in Burnley (was that a sand-witch hunt?) reveals nothing so it looks as though it's a genuine Burnleyite gaffe. I was quite fancying a toe of frog flour cake and an eye of newt nudger.